South Carolina Anti-Money Laundering Act now has requirements for individuals who wish to do business as money transmitters. Money transmitters need to obtain a license as well as maintain a valid money transmitter bond before they can operate legally in the state. Read on for all the details. 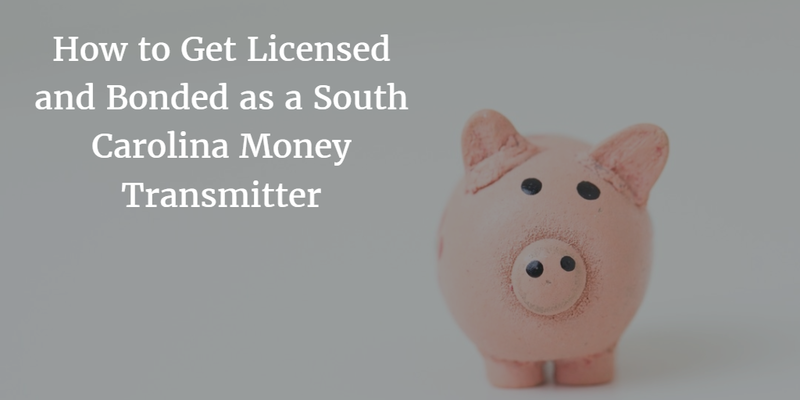 Everyone “selling or issuing payment instruments, stored value, or receiving money or monetary value for transmission” must now obtain a money transmitter license in South Carolina. Those who are not exempt from this requirement must obtain their money transmitter license from the state Attorney General. Once licensed, South Carolina money transmitters must maintain a net worth of at least $250,000 as well as permissible investments at all times. Licensees must further renew their licenses on a biennial basis, paying a renewal fee of $750, and submit renewal reports alongside their renewal application. Money transmitter bonds are a type of surety bond which protects people who work with money transmitters from fraud and dishonesty on part of transmitters. These bonds guarantee that if customers are treated unfairly they may file a claim against the bond and be compensated for their losses by the surety. The cost of obtaining a money transmitter bond depends on an applicant’s personal credit score, their financial statements, and a few other factors. The exact cost is determined on a case-by-case basis but applicants can always get a preliminary estimate of their bond cost by using a surety bond cost calculator online. Ready to apply for your surety bond? Start by getting a free quote!